This isn’t the first time The One’s use of pronouns has indicated he is at best conflicted about his own faith. And to be frank, even if he does consider himself a Muslim, he’s not a very good one by their own standards. I suspect the real point is he doesn’t worship much over and above himself. By now, however, seven years into a presidency that NEVER should have happened, it’s pretty clear that he doesn’t have any use for traditional America (hence his commitment to ‘fundamentally transform’ it), and doesn’t identify personally with the people he (unfortunately) leads. For some time, I’ve been of the opinion it won’t be long after this pathetic excuse for a Chief Executive leaves the White House that we finally start getting some accurate information about where he comes from and what he’s about. Lots of people ran interference for him to be able to get — and stay — in the Oval Office. Something about human nature can’t resist boasting about “pulling one over” on the electorate. I suspect when those stories start coming out in earnest, once Obama no longer has his hands on the now-thuggish machinery of government, there will be hell to pay. The fact that half the State governors are now saying they refuse to support the continued importation of a problematic people group is just one example to show how much damage this narcissist has done — and continues to do — at the federal level. 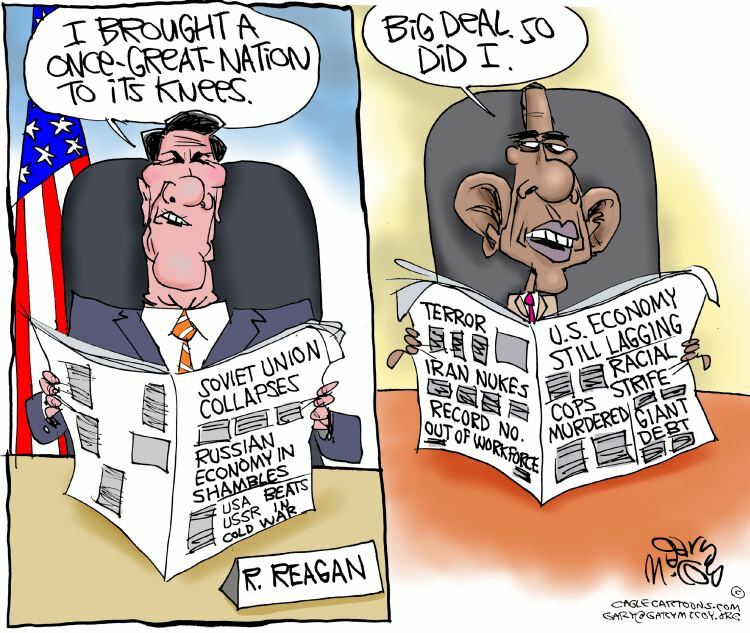 The struggling Soviet Union disintegrated just after Reagan left office. Kind of makes you wonder what happens to the U.S. come January 2017.